I have a love / hate relationship with paint. It depends on the day. Sometimes I know exactly what I want and it turns out exactly how I had hoped. Sometimes I know exactly what I want and it goes horribly wrong. And then of course, there are those times that I have no idea what I want... That's why it took a few different paint jobs in our bedroom to finally get it figured out. 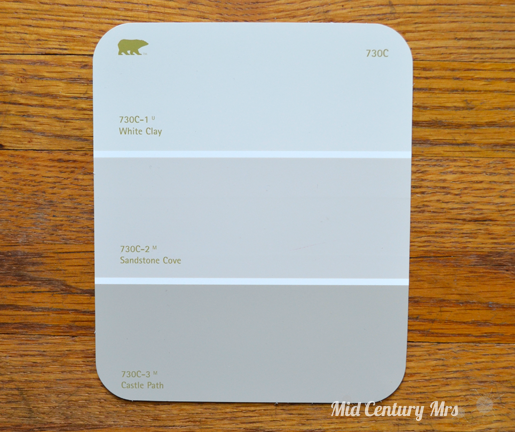 I usually like to have a room somewhat figured out before I pick the paint color. It's just how I work, but I don't get to work that way this time. 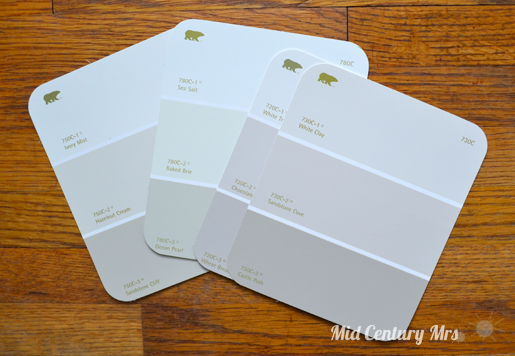 Having to pick out paint for rooms that I don't really know where they're going yet is hard. So, we decided to just stick with light colors for now. It's a basement with not a ton of natural light, I don't want to make it darker. We still have all of our old living room items (you can see that here) to put in the family room. So that color palette is what we have to work with, at least for now. In an ideal world, we could afford to get all new stuff for an all new space, but this renovation isn't cheap... We were aiming for off whites or really light tan / beige colors. For the office, I figured gray would be a nice neutral color to build off of. Most of the furniture I have for that room is the black Ikea stuff. For the laundry we had a little more room to do something fun. I thought maybe a mint color would be good. So, of course we headed over to the Home Depot to grab a ton of paint samples to go through... 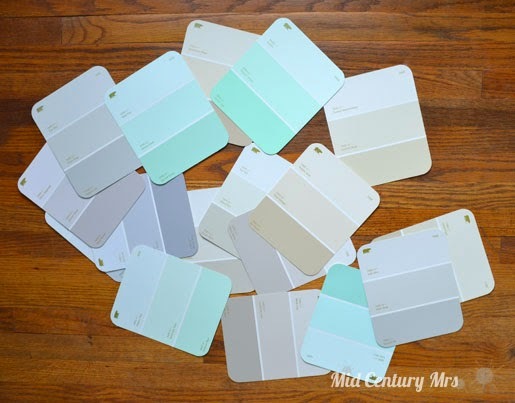 It was pretty easy to narrow it down to a few swatches for each room right away. Some things were too something... yellow, red, blue, etc. At first we narrowed it down to the these swatches. We still weren't quite sure how light we wanted to go, but the more I thought about it, the more sure I was that I wanted to be light. 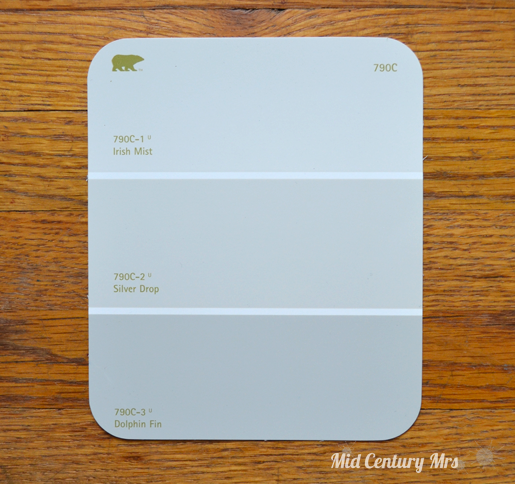 Eventually, Behr White Clay won out (top one in the swatch below). My hope is that it is still really light, but will still have just enough color to make the white trim pop. That swatch and my lighting isn't really doing it justice, so hopefully it will show better when it is up on the walls. Really only one stood out to me, but then it was a matter of the two lighter colors. I went back and forth between the Irish Mist and the Silver Drop. Behr Silver Drop (middle) won out at the very last second. 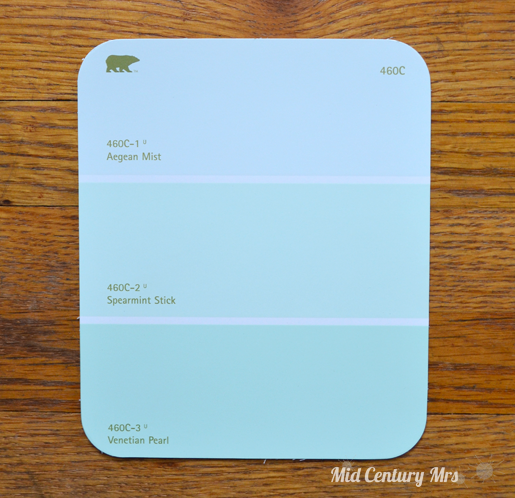 The laundry room mint was narrowed down to these swatches. 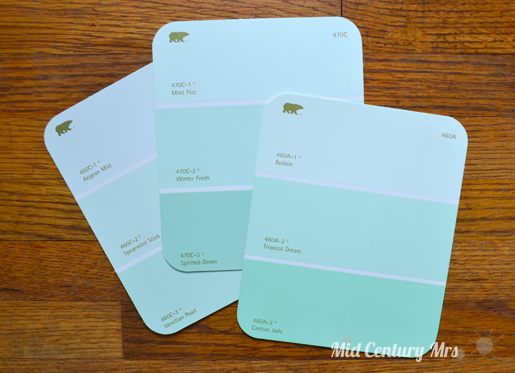 It took awhile, but we decided on Behr Spearmint Stick (middle below).